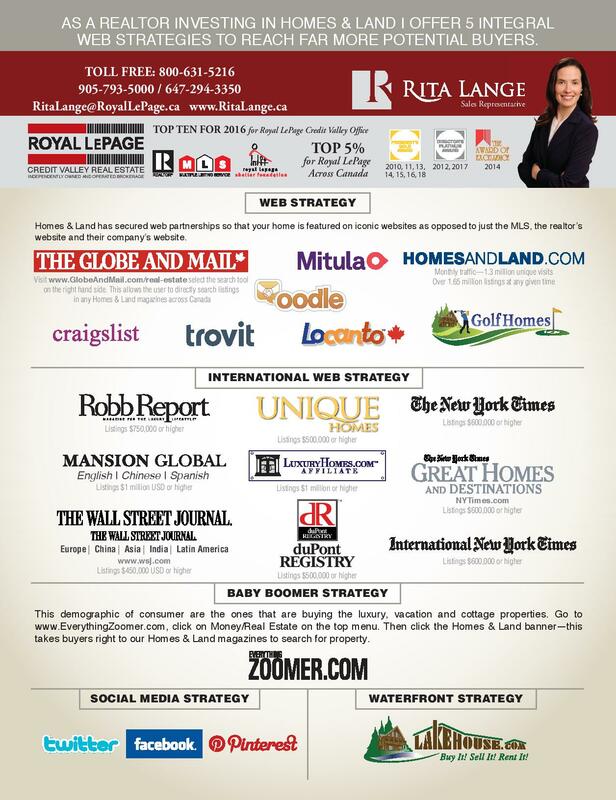 I am proud to advertise in Homes & Land Magazine Brampton, Caledon Mississuaga and surrounding areas. Homes & Land is the only multi-media real estate magazine on the market today, meaning, your listing is linked to websites that attract more than 100 million visitors monthly. Considering that an estimated 80 per cent of real estate buyers now use the Internet to search for a home, it is clear that advertising with Homes & Land is of great advantage to my clients. Homes & Land prints 132,000 magazines and is distributed every 28 days, 13 times a year to 2,600 retail locations with 500 across Peel and surrounding areas . Magazines are FREE and merchandised in floor and counter racking, in 831 strategically placed outdoor boxes, and all 24 GO Train stations. There are three cornerstones that form the foundation to the successful sale of your home: Pricing, Presentation and Marketing. As is often the case, if there is weakness in one element, the strength of the whole may be compromised, even fail. More than selling your home, my job is to market your home, to mount a comprehensive, multi-dimensional campaign that will reach out to both the real estate community as well as the buying public. Your home will be presented electronically on the Multiple Listing Service (MLS), REALTOR.ca, it will be featured on our Royal LePage corporate site as well as my personal websites RitaLange.ca and RitaLange.Homesandland.com and it will be uploaded to a syndication of North America’s top re-sale estate websites. Your home will have its own custom designed, full colour feature sheet. Ask about my additional advertising platforms I provide to market your home until SOLD.